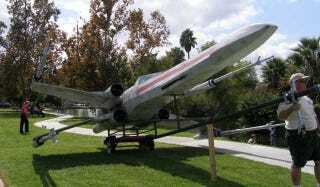 Click to viewAndy Woerner and his crazy rocketeer friends have built a 21-foot long X-Wing model that can actually fly. Yes, this is a real X-Wing powered by four solid-fuel rocket engines complete with radio-controlled moving wings. It blasts off in California next week, and we talked with Andy about the project, and how they expect it will do. All the details and a full construction gallery after the jump. The X-Wing model is huge. At 21 feet long and with a wingspan of over 19 feet it is, in fact, big enough to fly a kid in. However, knowing that it will be powered by solid-fuel rockets, they wouldn't put a kid, dog, monkey or Gizmodo editor inside, even if it uses three full parachutes to land. After drawing the plans using CAD software, Andy's team and his friends at Polecat Aerospace (with the help of RMS Laser and Aerotech Consumer Aerospace) used laser cutting to make the pieces out of Baltic Birch wood. They also used solid aluminum for some parts, like the rods which are the pivot point for the wings. Why solid aluminum rods? For the most impressive part of the project to work, not only does the axis have to be strong enough to support the stress of the launch but also it has to allow the wings to change position from folded to open while in flight—or, in the words of Red Leader, putting them in attack position, the X that gives the Rebel aircraft its name. The wings, including the root sections and the outer panels are about 8' long and weigh 60 pounds a piece, including the motors. The motion mechanism had to be able to move all four of these simultaneously, while keeping them in position relative to each other. Additionally, the motion hardware had to be strong enough to keep the wings in position once they were at the extents of their travel. They used an electric motor from a RC helicopter, reducing its 40,000 revolutions per minute to generate enough torque to move those massive wings. Still, the wings will take 35 seconds to travel from open to closed. Hopefully, they will be able to change before the flight ends, so they can get the full effect in the air. The wings also hold the engines. Andy told us they are using "four solid rocket motors which are Class M, the kind that produce a red flame"—which as you probably know, it's also the same color of the X-Wing engines' glow. Even with the aluminum rods, however, there's the possibility of structural damage. We asked Andy about how he expected the flight to go: "it's likely we will have a structural failure in the wings, but we are hoping it will hold." If it holds, the X-Wing will be fully recoverable. It won't land on its own, but Andy pointed out that they "will use parachute recovery, with three man-rated chutes which will have radio control deployment," like the wings position control. When I first learned about the project there was one thing that didn't click for me: why the X-Wing? It doesn't seem to have the right shape to be a rocket. Maybe a better option would have been an Y-Wing or A-Wing. But an X-Wing? Well, according to Andy, "it was the one design from Star Wars that made the most sense to try to scale for rocket power." And on top of that, it just looks cool. I completely agree.